The Hall-Hoag Collection includes materials that may depict graphic violence, and may contain graphic sexual content as well as offensive views and language. The views expressed in the content of the Hall Hoag Collection in no way represent the views of Brown University or the Council on Library and Information Resources. Although most of the collection has been processed we spent the end of last year cleaning up some of the loose ends. 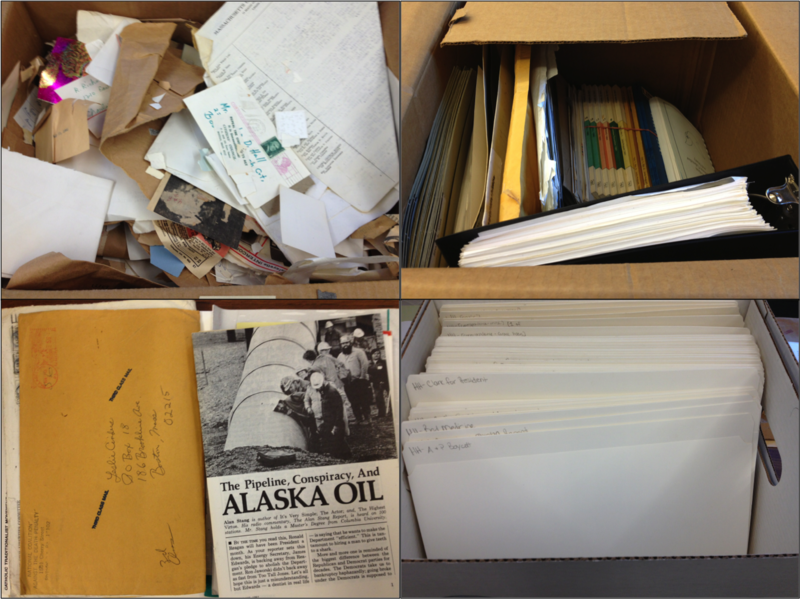 There were about 20 boxes of unprocessed material that we still had to accession and organize. Materials were taken out of the shipping containers they came in, reviewed and then placed into folders based on what organization published the document. Upwards of 400 folders are created from each of the shipping boxes that we process. The fact that we have received nearly 800 shipping boxes can give you an idea of the scope of this collection. The material came in shipping boxes (upper left) was organized and foldered (bottom right).